Performances & Dance Workshops On offer to Pro, Int/Adv, Beginner and the Local Public. 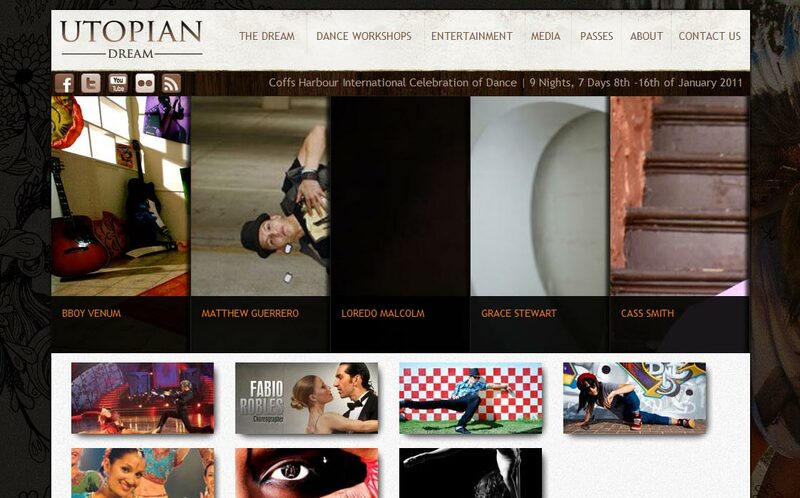 Utopian Dream is a multicultural dance festival held in Coffs Harbour AUSTRALIA with the best of the best international professional choreographers, performers and pioneer’s of Dance. In 2011 UD Artistic Director “Travers Ross” has designed the event to be completely open for the public to come and enjoy dance and be apart of the festival as an eye to watch, a pair hands to clap, join in and dance socially to the good vibe tunes or to give it a real good crack and dance with the pro’s. This event is designed to fuse cultures within the Coffs Harbour community, whilst inviting those nationally and internationally to participate in the festival. Utopian Dream is Open to the public and a combination fashion of Nightly and daily performances, Workshops, Competitions, markets stalls, multicultural foods, parties and seminars of Dance over over 7 days 9 nights. Dancers are invited from all over Australia and the world to participate, entertain and be entertained in the festival. The aim of Utopian Dream is to help promote healthy bodies, minds, encourage stepping out of your comfort zones and building positivity through the entertainment community and local community through dance. Definitely a rewarding event you owe to yourself, crew, dance school, friends and family no matter what career your in.